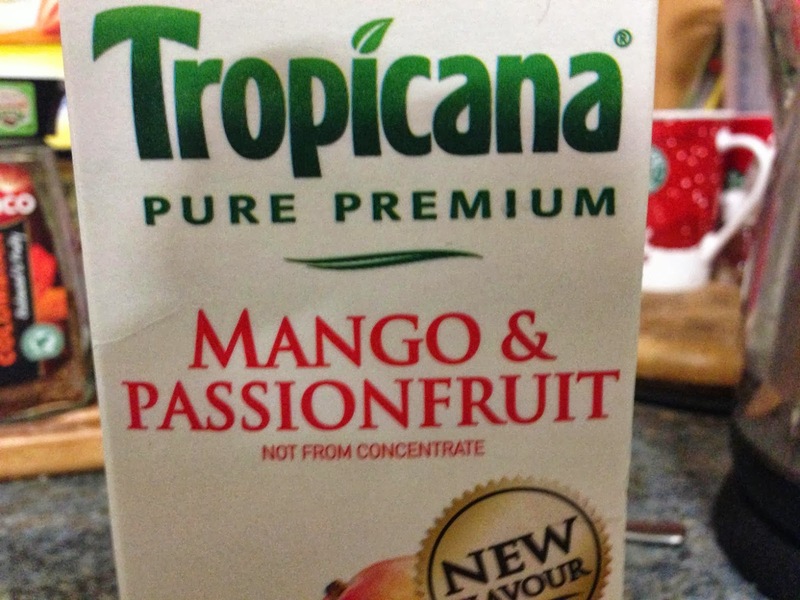 They're carefully within the law, because the product name isn't "Mango and Passionfruit Juice". The title refers to the dominant flavour, not the dominant ingredients. It's along the same lines as a Chicken and Mushroom Pot Noodle, which is only minimally chicken and mushroom. On a related note, most "tropical" juice mixtures are primarily apple, because apple is a bland, inoffensive taste that, in the mix, is dominated by the other ingredients. You wouldn't be able to drink pure passion fruit juice; it would be far too bitter. > It's along the same lines as a Chicken and Mushroom Pot Noodle, which is only minimally chicken and mushroom. China is currently producing rather flavourless apple juice in huge bulk; it's basically just various sugars plus water, but doesn't contain "added sugar". 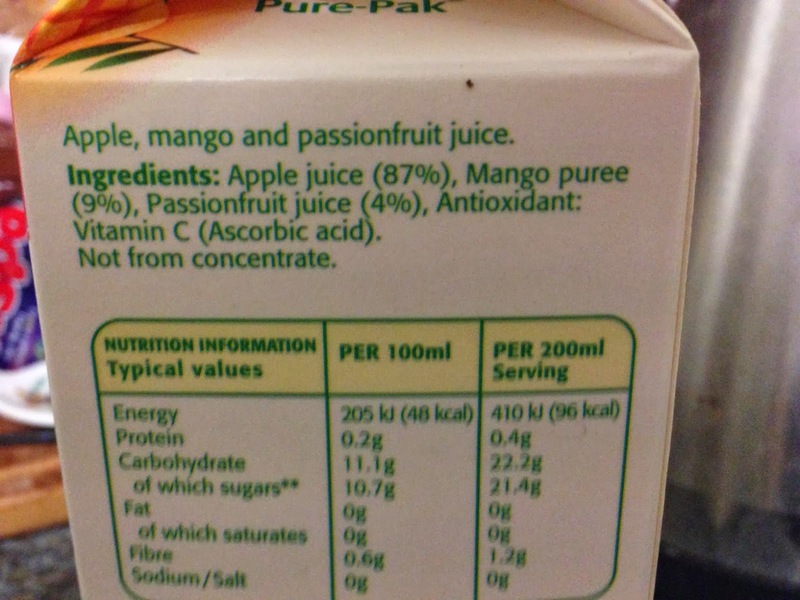 So, rather than make your Mango and Passionfruit juice drink from water, sugar, mango puree and passionfruit juice, they've made it from apple juice, mango puree and passionfruit juice; the content is the same, just the ingredients list is different. Well, Mango and Passionfruit *flavour* juice, maybe... But still feels misleading. I'm just as amazed that the same company has the cheek to sell their trop50 product. They sell it as 50% less calories and sugar than fruit juice. I suppose that sounds better than watered down fruit juice. Which is all it appears to be. "Mango and Passionfruit *flavour* juice,"
"Flavour" in this context mean "tastes like it but doesn't contain it", which definitely doesn't apply here. "Flavoured" is the word which means "tastes of it because it's got some of it in it" - but if we made people write 'flavoured' every time, you could no longer have 'chocolate biscuits' or 'peppermint tea' without tedious and patronising footnotes and subtitles. I would contend that there's no general problem with misdescription of food in the UK, and hoping for some regulator to put on even bigger boots and blunder around will have more undesirable, unintended consequences than good ones. The full list of ingredients is already on the packet, after all. "Mango and Passionfruit flavoured apple juice" would be fine, even listing the favour first, IMHO. But the headline does not even mention the main ingredient. The apple juice is a (relatively tasteless) carrier for the (more flavoursome, and thus less plentiful) mango and passionfruit payload. Quite, but I thought a puree meant basically that as well. 2) Cooking the mango in the country of origin will steralise it and as a result it will keep longer which in turn means it is cheaper to transport and the product can be manufacturered all year round. Has to be asked though, you're buying mass-produced processed food - do you really expect it to be meaningfully and usefully labelled? M&S have the same problem with some of their drinks. I've stopped buying them as the taste from the apple juice overwhelms the other flavours. Apple juice is sweet, cheap, and a good flavour base for the other juices which are naturally less sweet than the average palate. Almost every blender of juice does this, the alternative is adding sugar water. Sugar has a bad reputation at the moment, so apple juice, which is equally bad for you if not worse, is used! Yep this sort of thing goes on all the time, you've got to really look at every product with suspicion and question exactly what it is. As for tropicana, ever heard of Copella? it's now owned by tropicana but it's a british company based in Boxford, Suffolk. They use all their own apples and are generally cheaper than tropicana. I always buy their orange juice, the Apple & Pear is nice aswell, not tried any of their other juices yet but if those two are anything to go buy they will be nicer than tropicana.